Upgrade your toilet to a more hygienic no-touch flush. This easy-to-install retrofit kit brings a KOHLER touchless flush to almost any toilet. Once it's installed, just hold your hand over the tank sensor to activate the flush. No handle to touch means fewer germs to pick up or leave behind. Retrofits a standard toilet to touchless flush. Flush is activated by a no-touch sensor on top of tank for improved hygiene. Works with most canister and flapper toilets. Not compatible with dual-flush, top-mount flush, pressure-assist, or ballcock valve toilets. All Kohler Plumbing Products carry Kohler's one-year limited warranty unless otherwise noted. For full details please visit kohler.ca or call 1-800-4-KOHLER (1-800-456-4537). Designed to offer convenient cleaning, this adjustable trap features a cleanout plug and strainer to prevent debris from lodging. The 2-inch connection fits most standard pipes. Complete your toilet design with this left-hand trip lever. The simple styling of its blade handle, paired with solid brass construction, ensures long-lasting beauty and reliable performance. Also available in store by special order only see store for details. The Cimarron trip lever boldly accents the geometric look of the Cimarron Comfort Height(R) toilet. Constructed of solid brass, this left-hand trip lever will help unify your bathroom decor. 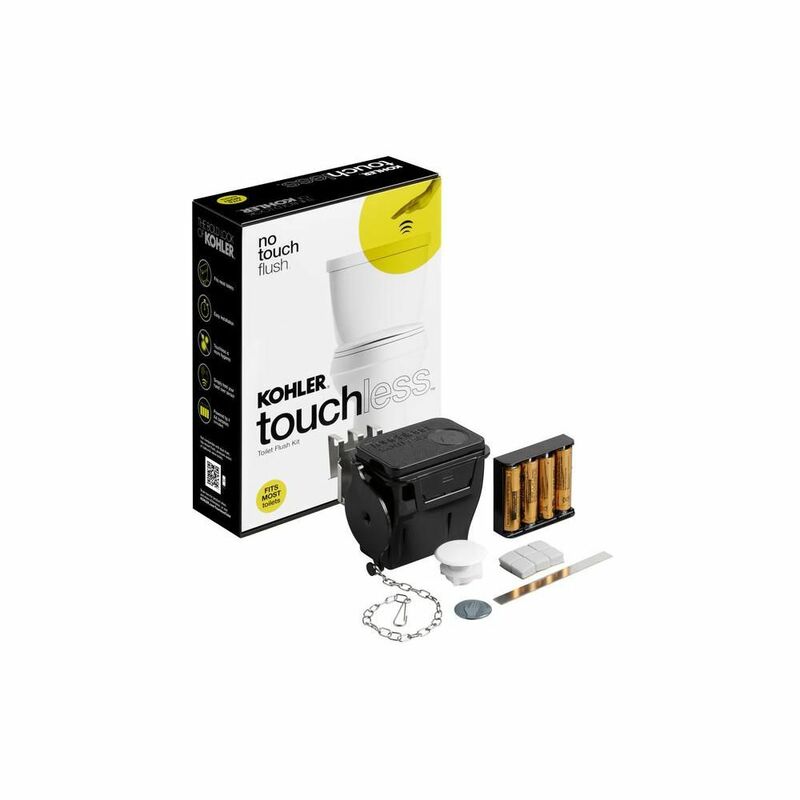 Touchless Toilet Flush Kit Upgrade your toilet to a more hygienic no-touch flush. This easy-to-install retrofit kit brings a KOHLER touchless flush to almost any toilet. Once it's installed, just hold your hand over the tank sensor to activate the flush. No handle to touch means fewer germs to pick up or leave behind. Touchless Toilet Flush Kit is rated 3.3 out of 5 by 277. Rated 2 out of 5 by wayne from Product did not meet the standard of the name brand... Product did not meet the standard of the name brand and did NOT function properly. Rated 1 out of 5 by Desiree from Great AT FIRST, water waste after a while Like the other reviewer stated, this is great starting out. We've had it for maybe 6 months now and it flushes on its own with nothing on the lid, no speck of dust, even the "hover here" sticker was removed. Even changed the batteries and it helps minimally. Waste of $55 and water. Rated 5 out of 5 by Lisa from Prefect!... Prefect! Rated 5 out of 5 by SLO from A couple of days after a plumber install it, it started to ghost flush. The plumber returned and ... A couple of days after a plumber install it, it started to ghost flush. The plumber returned and adjusted the chain; it has been working perfectly for the last three weeks.